On this page, you will learn everything you need to know about the types, symptoms, protection, prevention, detection and removal of computer viruses. Computer viruses can also copy (duplicate) themselves. Memory Resident Virus (2) - stays in memory after it executes and after its host program is terminated. In contrast, non-memory-resident viruses only are activated when an infected application runs. Overwriting Virus (3) - will copy its own code over the host computer system's file data, which destroys the original program. Direct Action Virus (4) - is considered to be “non-resident” and functions by selecting one or more files to infect each time the code is executed. The primary intentions of this virus is copying itself and to spread infection whenever the code is executed. Boot Sector Virus (5) - infects computer systems by copying code either to the boot sector on a floppy disk or the partition table on a hard drive. During startup, the virus is loaded into memory. Once in memory, the virus will infect any non-infected disks accessed by the system. Cluster Virus (6) - associates itself with the execution of programs by modifying directory table entries to ensure the virus itself will start when any program on the computer system is started. If infected by this virus it will look like every program on your PC is infected; however, this virus is only in one place on the system. Macro Virus (7) - is written in a macro language and infects Microsoft Word or similar applications (e.g., word processors and spreadsheet applications) and causes a sequence of actions to be performed automatically when the application is started or something else triggers it. 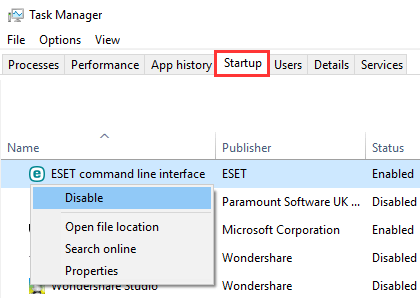 Don't click on OK, Yes or Run when a pop-up window appears and ask you to install unknown software. Here's one example: “Your windows computer could be at risk! 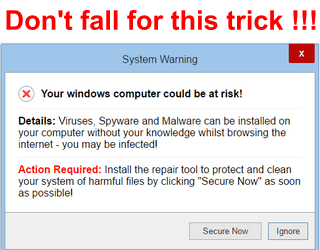 Install this repair tool to protect and clean your system by clicking Secure Now as soon as possible” Don't fall for this trick! Don't click on a link (in emails or web pages) if you don't trust it. When installing software, always pay attention and always read everything clearly before clicking Next, OK, Install, Continue, etc. 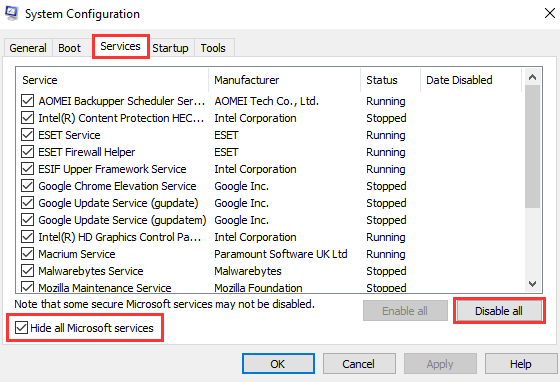 Microsoft recommends that you disable SMB1 on Windows for security reasons. The BEST protection against computer viruses is YOU. Then there's a good chance that your PC will get infected one day. It's recommended to always use an antivirus program on your PC – even when antivirus software can't protect your computer against all viruses. You should only use one antivirus program on your computer. It's also recommended to use second opinion virus scanners to get more complete detection coverage, because some programs may detect viruses that others might miss. You can use virus scanners alongside your current antivirus software. This way you get the chance to use other antivirus software on your PC without any problems. I will show you how to detect and how to get rid of a computer virus for free. The first thing you want to keep in mind when your PC is infected by a computer virus is whether or not you want to clean it. Because sometimes it may be a better idea to back up any data that you might have and reinstall Microsoft Windows or restore a system image backup that's 100% clean. Well, if your antivirus (antimalware) software detected a computer virus or other malware, then you will never know for sure if that's the only piece of malware that has infected your system. With the following steps, I assume that you have access to your system or at least can boot Windows into “Safe Mode with Networking”. Important! The order of the following steps are very important, so don't do these steps in a different order. Download and open Kaspersky Virus Removal Tool. Scan your PC with Kaspersky Virus Removal Tool and follow its instructions if it found something. Download, install and open Malwarebytes (note: to download the free version, you will have to scroll down to the bottom of the page and then click on DOWNLOAD 14 DAY TRIAL. You will get the Premium version for the first 14 days and after the 14 days it will turn into the free version – which is an on-demand malware scanner). Scan your PC with Malwarebytes and follow its instructions if it found something. Download, install and open Zemana Antimalware (for the download button of the free version you will have to scroll down to the comparison table). Scan your PC with Zemana and follow its instructions if it found something. Download and open ESET Online Scanner. Enable detection of potentially unwanted applications, scan your PC with ESET Online Scanner and follow its instructions if it found something. After these steps, your computer should be relatively clean. Thank you for reading this article. Hopefully, you learned enough about computer viruses to keep your PC clean and safe. If you want to learn more about computer and Internet security (cybersecurity), then visit this page.